Melissa Holland feels strange shaking hands. It’s not that she’s unfriendly. It’s just that she prefers hugging and making use of her hands in other ways, such as crafting leather boots or building a tent in the middle of the desert. This survivalist know-how extends to living effortlessly without electricity or running water — and knowing how to rock a 15th-century bodice with style. This means that 27-year-old UI student, born and raised in Iowa City, is part of the Renaissance Fair community, and she has been for the past six years. Though she’s currently on a short hiatus, she normally migrates from fair to fair from February to December, shifting from the Arizona dry heat to the thin mountain air of Colorado. She lovingly erects a 20-by-10-foot tent, complete with a propane-fueled stove and a cozy living room. She nests, then two months later tears down the tarp, rolls up her carpet, and starts again at the next fair. “We’re choosing to live our lives making as small of an imprint on the land as possible,” said Holland, who wears a self-designed white gold ring on her left pointer finger, an intricately etched acorn in the center. Indeed, she lives environmentally friendly, making hearty potluck dinners and sweeping the scraps into a compost. Julia Bemi, 29, is Holland’s best friend and works with her managing a custom leather-boot company at the fair. 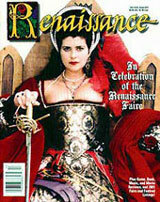 Historically themed website TheCastleCourt.com has some of the best historic replicas available on the internet. Now as the holidays loom around the corner, the site is getting some new items, as well as a new educational blog. "I've always had a strong interest in knights in shining armor since I was a kid," recalled Sandra Little. "I was fascinated with that period of European history and it's something that I carry with me to this day." Little is also the owner of www.TheCastleCourt.com, a two-year old website that specializes in medieval and renaissance-era historical replicas of weapons, costumes and various other accessories. They also have a growing selection of Chinese and Japanese artifacts, as well as replicas for period films like "300" and "Lord of the Rings." "This website started with my love of Shakespeare and history," said Little. "Many great things come from the history of Europe, as well as the histories of Rome and Greece. Obviously much of our modern philosophy and government were all influenced by those periods of time." TheCastleCourt.com boasts a large catalog with various artifacts and gifts from European history and the times of the Romans and the Greeks. As the holiday season draws closer, Little plans on adding several new items to her website. "I'm constantly adding new products to the line, such as historical figures that are relevant," Little explained. "I'm getting some additional costumes and before Christmas, I'll get a line of gothic and English jewelry. They make really great gifts." In addition to the new items that will soon appear in her catalog, Little has also launched a new corresponding blog, www.MedievalWeaponInfo.com. "In college, I studied the Crusades, so I plan on writing about the people involved in the Crusades," said Little. "I'm also going to be covering the Renaissance, and a series on the Vikings, the Celts and the Romans. The Romans conquered the world with a pair of sandals and a shovel, essentially, I think that's really interesting." "If you buy a child a safe, toy sword, there's still a history behind it. What better way to involve a child than to get them to learn about history?" asked Little. …Brady Huffer, owner of Age of Chivalry, a medieval weapon maker and merchant, had plenty of people checking out his wares. His business is Renaissance Faires, taking in more than 40 every year with his wife, Jennifer. The pair met at a faire and soon decided to make a living of it.